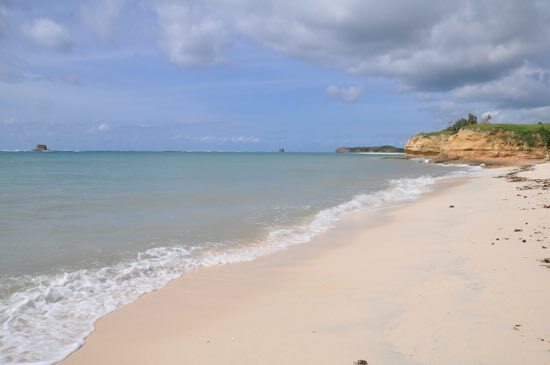 Photo: A deserted beach on the southern coast of Ekas. Tacked onto the southeast coast of Lombok almost as an afterthought, Ekas is arguably the most spectacular part of the entire island. While "Ekas" particularly refers to a village on the peninsula’s western coast, we use it here for a catchall for the entire southeast corner of Lombok. Stunning cliffs plunge into soft white sand beaches while picture-perfect waves roll in one after another. 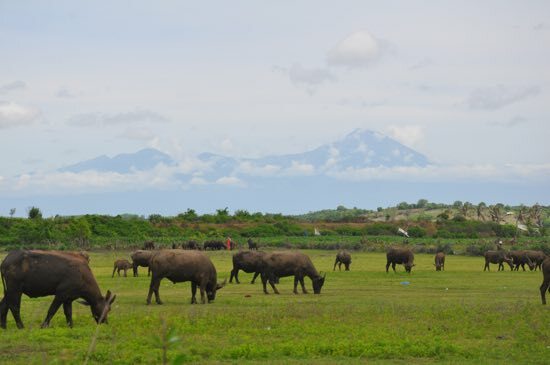 This is wild and rugged Indonesia at its best and, thanks to an improving network of roads, more and more of it is becoming easier to access. Roughly triangular in shape, Ekas has the Ekas Bay to its west, the Indian Ocean to the south and the Alas Sea to the east. While much of it is cliff-face (similar to the Bukit Peninsula in Bali) much of the south coast is lined by beautiful white sand beaches easily approached by car or motorbike. To the southwest lies Sungkun Beach, which you’ll need a 4WD to reach in wet season, but we -- just -- managed it in an Avanaza after a few days of no rain. This beautiful beach has an offshore reef keeping the monstrous waves back off the sand. A headland at the western end can be climbed to offer spectacular views over the entire beach -- it’s well worth the effort getting up there. To the far east you’ll find Pink Beach, Jeeva Beloam and a lighthouse on the cape. As with the roads, the options for accommodation have improved – there are now at least two homestays and one midrange resort to choose from. A higher end, foreign-owned resort overlooking Ekas Bay gets plenty of great write-ups elsewhere -- you won’t be reading about them on Travelfish though, as they appear to believe they have ownership of the waves out front of their plush digs. Nobody owns the waves and we suggest you enjoy your stay at one of the other accommodation options in Ekas -- Ekasbreaks is a good midrange option, while Ekas Homestay and Tira Villa are reasonable budget choices. Gorgeous beach & break hogged by a resort. While most foreign travellers are here for the surf -- the breaks are excellent -- Ekas is also a great destination for the dedicated beach bum, as there are plenty of beaches to choose from. If you have your own transport, Ekas is an excellent area to explore under your own steam. Unless you’re staying at the salubrious Jeeva Beloam set near the eastern extreme of Ekas, you’ll most likely be staying to the west, either in Ekas village or somewhere to the south of there along the road that runs from Ekas village all the way south to Sungkun Beach. This road makes Sungkun one of the most convenient beaches to reach -- just keep following the road! After a bit of a hill you’ll reach Sungkun village; keep going straight ahead, take a left and then shortly after you’ll see a smaller trail to the right -- this will lead you to the beach, where a dirt trail runs much of the length of the beach. Climb the sizeable headland at the western end of the beach -- there’s no clear path but it isn’t too hard -- for spectacular views down the beach. 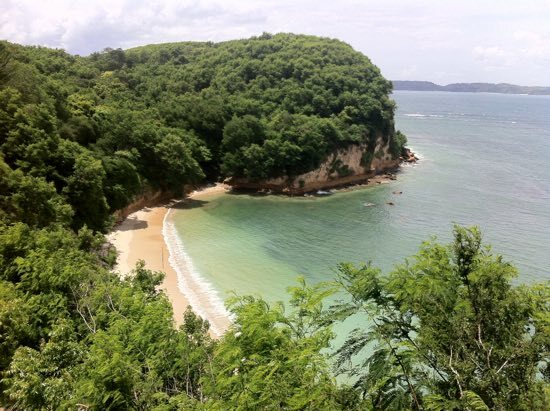 The beach here is protected by an offshore reef, which means you get some relatively calm waters over the inner lagoon. 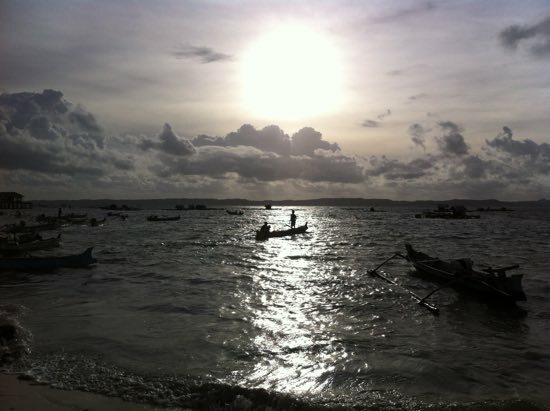 When we visited a lone spearfisher was in the bay -- it was otherwise deserted and gorgeous. Late light at Ekas village. Running along the west coast from Ekas village to the southwest tip of Ekas are a series of bays and beaches that can be visited by boat from Ekas village, via a poorly marked trail, or if you’re able to gain access, through a resort that blocks access to public land if you happen to have a surfboard with you. They are beautiful bays, set at the base of cliffs (so yes, stairs are involved) and boast clear waters and beautiful strips of sand. In off-season, they are not cleaned so can get quite dirty with flotsam and refuse. Personally we preferred Sungkun mentioned above -- for the lack of stairs, the lack of bullying resorts and the lack of other people! Another hectic day at Kaliantan. Your next good options are Cemara and Kaliantan beaches, which are about a five-minute drive apart but a solid 20-30 minute drive or ride from Ekas. The roads to both are sealed and in good condition, but once you reach Kaliantan village it deteriorates to a rough hardbase road, which is still driveable. From Ekas you head back on the road towards Lombok proper and you’ll see an all-weather road signposted to Pink Beach running off to the east -- take that and follow the signs to Kaliantan or Cemara (it is the same road most of the way). Cemara beach is a eastern-facing beach that looks over a small bay. The waters are calm and a few cabanas set up let you escape the heat of the sun. Litter around the cabanas is a problem, but we found the beach itself to be pretty and clean. This is a good one for kids to go swimming at as the waters are mostly very calm. Back up a little from Cemara and you’ll see a sealed road running to the south. 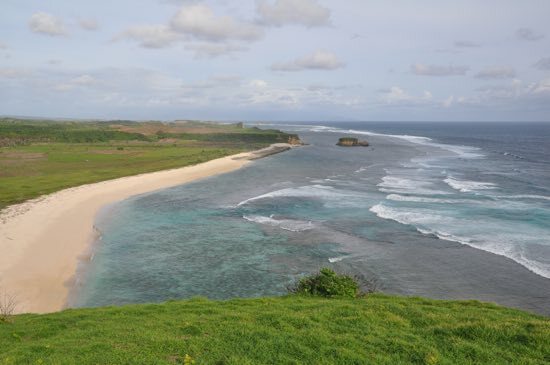 This leads to Kaliantan beach, which, like Sungkun to the west of here, is a long, broad and exposed beach. You’ll reach the village first (take a left) and then a fishing hamlet that sits right on the sand. Some islands are sprinkled just offshore and during king tides the waters recede so far you’re able to walk all the way out to the large island offshore. It is possible to arrange a boat trip out to around the islands from the fishing village -- ask around if the boatmen don’t find you first. It is at Kaliantan that the biggest of the Bau Nyale festivals take place, attracting thousands of people. A Sasak festival focused around a worm harvest, the gathering takes place annually sometime in February or March -- the date is normally decided upon in December or January, so this isn’t an easy one to plan around. At the western end of the beach (past the lagoon) is another climbable headland that offers tremendous views over the beach and the triple break offshore. There is also another great beach further to the west that you should be able to reach on foot from the headland -- though we didn’t try that one ourselves. Pink Beach is indeed pink. If you’re still on the lookout for more beaches, you’ll need to head a bit further to take in Ekas’ main claim to fame, aptly named Pink Beach. 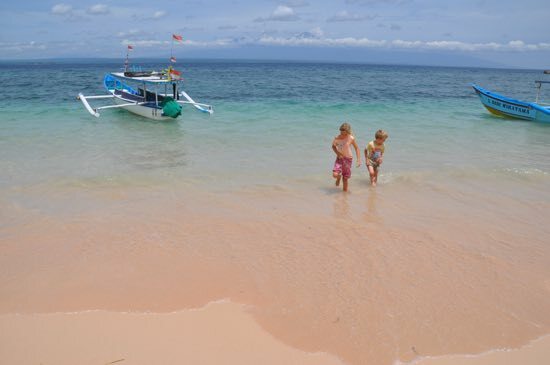 Like the same-named beach in Komodo National Park, Pink Beach has sand with a slightly pink hue thanks to a distinct red coral that grows here and gets slowly ground down by the waves. It’s a pretty beach, and far more popular than those mentioned above, especially on weekends, but it’s still pretty sleepy. A few food and drink stalls sell cup noodles and fresh coconuts, but that is about it. As the beach is on the north side of the peninsula, the waters are calm and the snorkelling, both right offshore and off the nearby islands, is reportedly good. Boat men will approach you to offer their services either for an hour or a half-day spent lolling around the bay. On the day we visited it was blowing a gale and so not all that conducive to a snorkelling trip. Pink Beach sits almost at the end of the eastern extreme of Ekas, about 10 minutes past the turnoff to Jeeva Beloam. There is a signposted and very steep concrete road leading down to the beach -- novice scooter riders may want to leave their bikes at the top and walk down. This is the only beach on all of Ekas we were charged to enter (10,000 rupiah for a car). Don’t tell the rental agency about the roads. Continue past the turn-off about another 500 metres and you’ll reach Ekas Lighthouse. 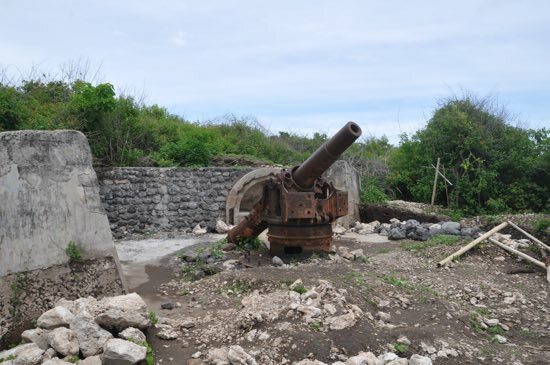 While the lighthouse itself is unremarkable, there is a World War II-era Japanese cannon about 10 minutes’ walk past the lighthouse (just follow the trail). 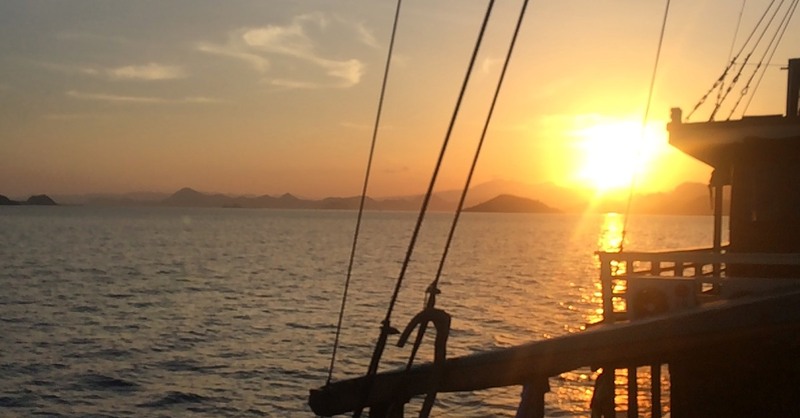 Positioned to overlook the strait between Lombok and Sumbawa, it is kind of staggering to imagine that a cannon like this was sufficient to intercept maritime traffic between the two islands. There is apparently also a cave around here, but we couldn’t find it! The scenery in general is rugged and spectacular -- if you make it as far as Pink Beach, it is worth doing the extra yards to reach here. Back in my day, all we needed was a cannon. The road from Ekas to Pink Beach when we visited in early 2015 was seeing a lot of work. The first half of the road is fine -- sealed and all weather, but the second half was in very poor condition -- we barely did it in an Avanza -- and we’d imagine it would be close to impassable after heavy rain. That said road work was ongoing and we’d expect that by later in 2015 the road, at least as far as Jeeva Beloam and Pink Beach, should be fine. Ask after the conditions at your guesthouse or hotel in Ekas beforehand if you are concerned about the standard of the road. 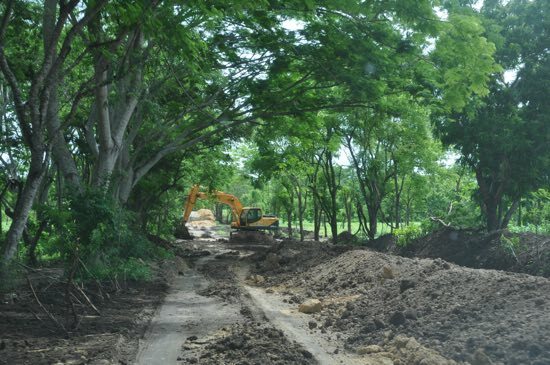 Once the road is finished we’d estimate it would take 45 minutes to an hour to drive from Ekas village to Pink Beach. Browse our independent reviews of places to stay in and around Ekas. Planning on riding a scooter in Ekas? Please read this. 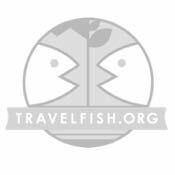 Use the above map to find specific destinations in and around Ekas which are listed on Travelfish. Bed icons indicate a guesthouse, hostel or hotel, the knife and fork is an eatery or bar and the four-way circular thingy marks sights, attractions and other points of interest. Click on any icon for a short pop-up and a direct link to the page for that spot. If you are in the area, use the teardrop icon near the top left to show your position on the map (you'll need to allow position sharing for this last feature to work).